Class 1M have been looking at how each number carries a specific value as part of our maths learning. One of the most effective ways to learn this is through plenty of singing and participation! We have been singing together songs such as Five Little Ducks to help with our learning. The pupils have also been playing many games on the class whiteboard that involve counting a set number of items. 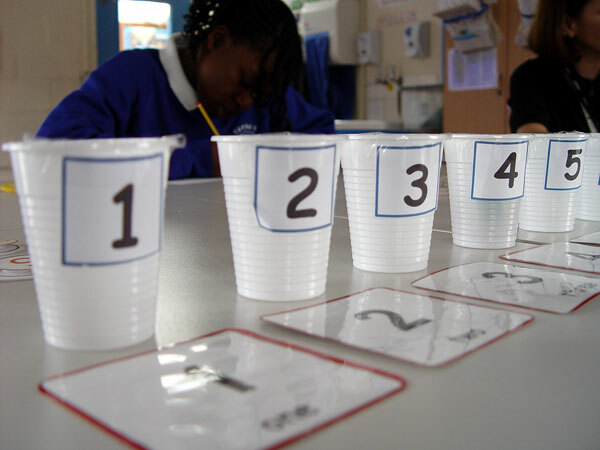 The key to learning here is for the pupils to make the physical connection between the items that they can see in front of them, and the corresponding number on our number lines. This is a theme that we built upon our maths table activities. Various activities were set up, depending on the learning aims of each pupil. Some class members were asked to correctly sequence number cards from 1 to 10. Other class members were also able to identify a number on a plastic cup, and then count out the correct number of cubes to go inside. Some Class 2S members also carried out some simple addition. Our PE work in Class 1M has involved the students taking part in a simple gymnastics circuit. We set up a short course in the Turney School gym. The pupils were asked to participate independently, although adult help was at hand if they required it. A good sense of balance was key for the Class 1M pupils to complete the course. We learnt how we could use our arms to help keep a good sense of balance. You can find out a little more in the video above.